while building memories that last a lifetime. 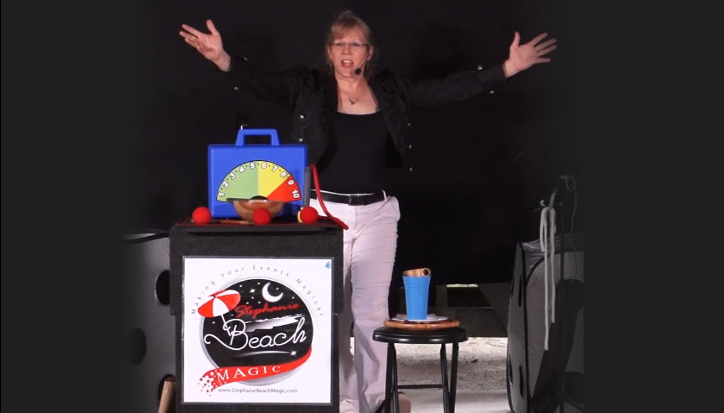 Stephanie Beach is a Professional Magician specializing in Comedy Magic. The spring class is Orange wand. Starting March 4th. I can’t wait to perform for you, your friends, Family and your kids. This is Live Entertainment. Live entertainment for your child creates an experience they will be talking about for years. Parlor magic is neither silly nor childlike. It is designed for the entire family and that means Good Clean Entertainment right at home. A Stage, Walk-Around or Parlor show just for your event. Perfect for Weddings, Celebrations or Business Events. Not a magic course with life skills sprinkled in, a life skill course camouflaged to look like a magic course. You not only entertain, but you engage the audience. All of our campers, young and old, look forward to you… It is always so fun! The passion you have for what you do certainly shines through. I am sure my kids will look back at the pictures and videos and think this was one of their best birthdays ever! Steph is an amazing magician! She is very engaging and captivates her audience. She is very reliable and is always looking to help. Your performance contributed to the success of this year’s event. We appreciate the time and talent you devoted to your performance. You went above and beyond. The fact that you came early and when my children were all excited to see what you had you engaged them and let them help you.